CHRISTY MORRISSEY WASN’T shocked when her research revealed two commonly used insecticides are harmful to songbirds. What did surprise Morrissey was just how harmful the insecticides turned out to be, even when consumed by migratory birds in very small doses. Her study with postdoctoral fellow Margaret Eng demonstrated that low and intermediate doses of the chemicals—called neonicotinoids and organophosphates—were extremely toxic to white crowned sparrows, causing them to lose up to 25 per cent of their body mass in just three days. “We weren’t expecting that, to be honest. That was not part of the study,” says Morrissey. In fact, Morrissey says, the birds were purposely given low doses of the insecticides, at just 10 per cent and 25 per cent of the amount that would normally kill about half of the population. The researchers “weren’t aiming to kill” and wanted to be “well, well below” that fatal level, she says. “And we still saw these really strong effects that we weren’t expecting on weight loss. So that was certainly an important finding, and a surprise,” Morrissey adds. The team’s research results were published online in late 2017 in the journal Scientific Reports. Another unanticipated finding was related to migration. The birds that were orally treated with imidacloprid, a very commonly used neonicotinoid, became disoriented when they were put into circular cages. If the migratory birds did survive the imidacloprid dosing, they could recover and eventually regain their body mass and sense of direction. However, they still faced some long-lasting negative—and potentially fatal—consequences as a result of the poisoning. A self-described “complete animal lover,” Morrissey has long been interested in the natural world. Birds, however, became a particular passion during her undergraduate studies at the University of British Columbia (UBC). At that time, Morrissey was a student of famed ornithologist Professor Jamie Smith, who would take his students on lunchtime bird walks and to B.C.’s south Okanagan to see and study birds. “I became completely obsessed at that point,” she recalls. After completing her undergraduate science degree, Morrissey moved on to PhD studies at Simon Fraser University. In 2010, following seven years of postdoctoral work at UBC and at Cardiff University in the U.K., Morrissey came to the U of S.
She now allocates 70 per cent of her time to the College of Arts & Science’s Department of Biology and 30 per cent of her time to the School of Environment and Sustainability (SENS). She also has an associate membership in the university’s toxicology program. Morrissey says she has a strong interest in both “bugs and birds,” focusing her research on avian wildlife and freshwater ecotoxicology. In addition to pesticides, she studies a broad range of other chemicals, including industrial pollutants and mercury. Her research tries to explain how exposure to environmental contaminants during key life stages affects a bird’s fitness. Morrissey describes birds as signals to the overall harm that’s being done to the environment; they’re the proverbial canaries in the coal mine, so to speak. Morrissey uses a variety of field, lab and captive studies to link exposure and effects from the cellular level to the whole organism. Some of her research is conducted at the new Facility for Applied Avian Research on the U of S campus—the only facility of its kind in Western Canada—where she serves as director. 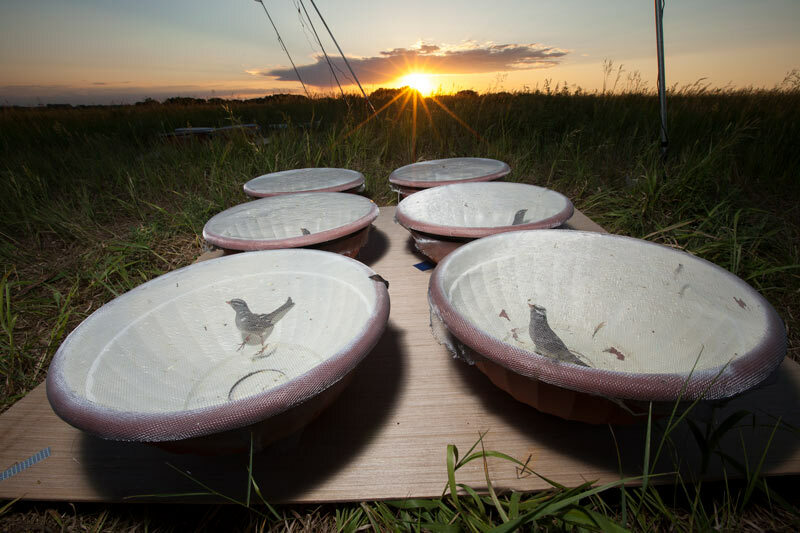 It allows researchers to link field and lab studies on birds and improve their ability to assign causation of effects from environmental stressors, such as pollution. Morrissey notes birds aren’t the only living creatures impacted by agrochemicals; there are linkages between organophosphate insecticides and cancers, neurological diseases such as Parkinson’s and developmental effects in children, including ADHD. Agricultural chemicals can contaminate wetlands, surface waters and soil, and impact the various vertebrate organisms within the ecosystem. For example, neonicotinoids—which are commonly applied to seed coatings to prevent bug infestations in crops—are a thousand times more toxic to insects than the older DDT, she says. Insectivorous birds can ingest neonics by eating treated seeds or experience lower food supply when the chemicals kill or harm the bugs. Morrissey and Eng started their sparrow research, in part, because of previous research linking low doses of imidacloprid with neurotoxic effects on other species, including honey bees. Morrissey notes one of the reasons neonics have become so widely used in agriculture is that they were believed to be safer to humans and the environment than some other alternatives. However, “that doesn’t mean that they’re completely safe,” she adds. Morrissey’s 2016 sparrow research was repeated in the spring of 2017 on a larger scale. Birds were captured in southern Ontario for just one day and were given a single oral dose of insecticide at half the levels previously administered in 2016. The birds were tagged so that their migration could be tracked. Although the 2017 data is still being analyzed, Morrissey says it appears the birds lost weight even after receiving just a single dose. While scientists, environmentalists and others have been concerned about pesticide use for decades, Morrissey is critical of the current pervasive “prophylactic” use of these chemicals in modern-day agriculture. No longer are chemicals being used in local, targeted ways for brief periods of pest infestation; rather, they are “being used extremely widely and on virtually every seed that is put in the ground,” she says. “So the area being coated is enormous, but we usually don’t find piles of dead birds. That’s the thing—it’s highly unlikely that you’re going to see it. It appears to be one of these secret problems that we don’t know much about. If these (pesticides) are continuously harming birds over large areas, you’re not necessarily going to see a mass kill,” Morrissey says. “But what we do know is that songbirds—and particularly migratory birds that are associated with farmlands as well as long-distance migrating birds—are seeing some of the most serious declines of any group of birds in North America. 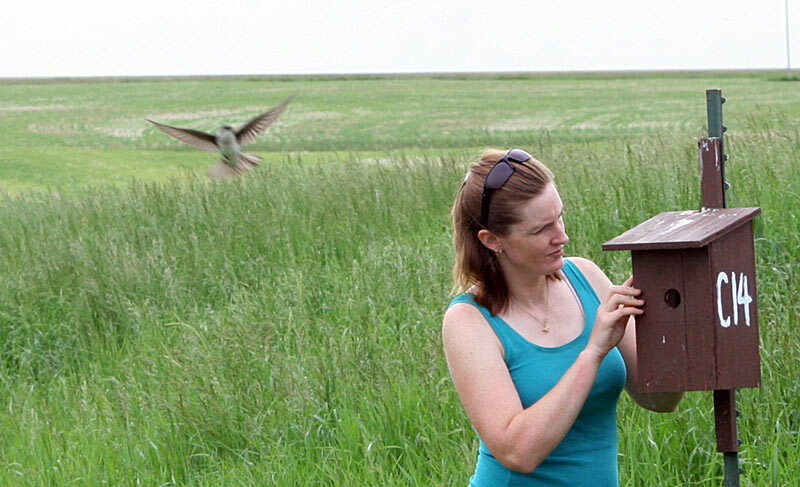 Christy Morrissey examines a tree swallow nestbox as part of research into the effects of neonicotinoids on the breeding biology and physiology of insectivorous birds. Morrissey is not alone in her concerns about the impacts of chemicals on wildlife and the environment. She is currently building a network of scientists and other scholars to study and discuss the issues from interdisciplinary perspectives. The new network—the Canadian Prairie Agroecosystem Resilience Network—will be a group of soil and wetland scientists, biodiversity specialists, agronomists and economists working together to see if there’s a better way to do agriculture. “The way we’re doing agriculture is not sustainable for the environment. I think that’s the message,” she says. Because Saskatchewan is a major agricultural producer, the province is also the largest chemical user in Canada. Morrissey believes people have become too complacent about chemical use—and that needs to change.